cerebrospinal fluid the fluid within the subarachnoid space, the central canal of the spinal cord, and the four ventricles of the brain. 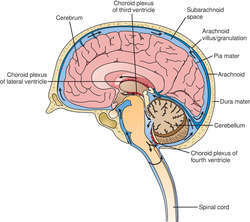 The fluid is formed continuously by the choroid plexus in the ventricles, and, so that there will not be an abnormal increase in amount and pressure, it is reabsorbed into the blood by the arachnoid villi at approximately the same rate at which it is produced. The cerebrospinal fluid aids in the protection of the brain, spinal cord, and meninges by acting as a watery cushion surrounding them to absorb the shocks to which they are exposed. There is a blood-cerebrospinal fluid barrier that prevents harmful substances, such as metal poisons, some pathogenic organisms, and certain drugs from passing from the capillaries into the cerebrospinal fluid. The normal cerebrospinal fluid pressure is 5 mm Hg (100 mm H2O) when the individual is lying in a horizontal position on his side. Fluid pressure may be increased by a brain tumor or by hemorrhage or infection in the cranium. hydrocephalus, or excess fluid in the cranial cavity, can result from either excessive formation or poor absorption of cerebrospinal fluid. Blockage of the flow of fluid in the spinal canal may result from a tumor, blood clot, or severance of the spinal cord. The pressure remains normal or decreases below the point of obstruction but increases above that point. Cell counts, bacterial smears, and cultures of samples of cerebrospinal fluid are done when an inflammatory process or infection of the meninges is suspected. Since the cerebrospinal fluid contains nutrient substances such as glucose, proteins, and sodium chloride, and also some waste products such as urea, it is believed to play a role in metabolism. The major constituents of cerebrospinal fluid are water, glucose, sodium chloride, and protein. Information about changes in their concentrations is helpful in diagnosis of brain diseases. Samples of cerebrospinal fluid may be obtained by lumbar puncture, in which a hollow needle is inserted between two lumbar vertebrae (below the lower end of the spinal cord), or into the cisterna cerebellomedullaris just below the occipital bone of the skull (cisternal puncture). Pressure of the cerebrospinal fluid is measured by a manometer attached to the end of the needle after it has been inserted. Abbreviation for cerebrospinal fluid; colony-stimulating factors , under factor. 1 abbreviation for cerebrospinal fluid. 2 abbreviation for colony-stimulating factor. Abbreviation for cerebrospinal fluid; colony-stimulating factors. The clear fluid that surrounds the spinal cord and brain and acts as a shock absorber. In one third of the patients developing incisional CSF leakage the initial mode of treatment was the institution of conservative measures. It can not only clearly show the larger CSF fistula but also demonstrate the smaller CSF fistula where CT cisternography fails to identify the sites of defect, inactive CSF leak, and CSF leak with multiple fistulae. Previous studies considering CSF glucose levels have either shown that there exists no relation between CSF glucose and the patient prognosis ; or have reported low CSF glucose levels in acute cases due to hyperglycolysis in the brain . The researchers explored these dynamic fluctuations by floating young brains in old CSF and old brains in young CSF. Cerebrospinal fluid found to play a role in brain stem cell development: potential clues to brain tumors? Of the nonhematic CSF, 11 (13%) had a positive DD value, 7 of which were pediatric. Injection into the lumbar region can be adequate since the blood may travel to the site of the dural leak and injection will result in elevated CSF pressure," Dr. According to Lai et al, intrasphenoidal meningoencephaloceles usually present with CSF rhinorrhea. Equilibration of glucose between plasma and CSF takes approximately two hours; therefore, CSF glucose reflects plasma glucose from a few hours earlier. account of betting duty and other deductions and, in order to compare the Exacta with the CSF, Exacta dividends had to be reduced by nine per cent. Tissue called the choroid plexus, deep inside the brain, secretes most of the CSF. Student membership is accepted based on what CSF or CJSF advisers and school principals tell us about the level of the courses a student completes.